Something creamy and sweet is ready to go down your throat. Relax, because we are talking about the delicious Strawberry Vanilla Custard. It is going to feel as if you just took a bite of a delicious pastry filled with some creamy goodness. As you slowly begin to take a pull of this e liquid, you can feel it smoothly travel around your mouth as if you took a bite and now the filling is spreading all over. The vanilla custard is going to be creamy and it will most likely just melt in your mouth. You can carefully feel it being savored by your taste buds and making them go crazy. The strawberries are going to add this amazing sweet kick that is just going to make your mouth water whenever you decide to introduce it to this amazing e liquid. As this blend gently begins to make its way down your throat, you get this small throat hit that is going to make you feel as if the strawberries that were used to create this blend were some of the ripest berries anyone can ever find. The creamy sensation is going to be amazing and the only thing you might be eager to do is to let it all out so that you can take another fresh pull. The vape juice is easily going to make a grand exit so that the trip does not have to end right away. Do not let these flavors leave your system so fast because if you do, you will be missing out on the small sweet hints the e liquid drops as it smoothly leaves your mouth. The clouds that will come out of your mouth are going to smell amazing and be obnoxiously big, but it will all be worth it. 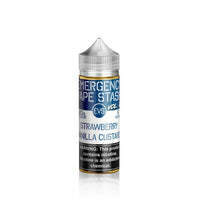 Strawberry Vanilla Custard - Emergency Vape Stash Vol 2 E Liquid has a rating of 5.0 stars based on 1 reviews.